Here are a bunch of recent motoring and transport trends based on published government data that build up a picture that despite having to cope with more and more vehicles cluttering up our lives, they are being used less and less and younger adults turning away from cars in very significant numbers. Notice how the slope of this first graph reduces after 2005. Even with this reduction the number of vehicles on our roads has increased by a remarkable 8 million units between 1994 and 2013. No wonder it is hurting! The population has of course also been rising fast and this graph shows the ratio of cars to population which leveled off at 45-46% in 2005. This is one of the indicators that lead an increasing number of academics to suggest that something significant is changing in our relationship to car ownership who are now looking carefully to see if this as a ‘pause’ to be followed by renewed growth, a ‘saturation’ which will now be maintained, or a peak that will be followed by a decline. This next chart shows the number of cars registered for the first time each year, most of then new vehicles coming into the fleet. This peaked in 2002 and 2003 with 2.5 million vehicles added in each of those years, with a low in 2011 of about 1.7 million before renewed growth recently with 2 million units sold in 2013. Needless to say, the size of the fleet is also linked to the number of cars scrapped or otherwise removed from use each year. 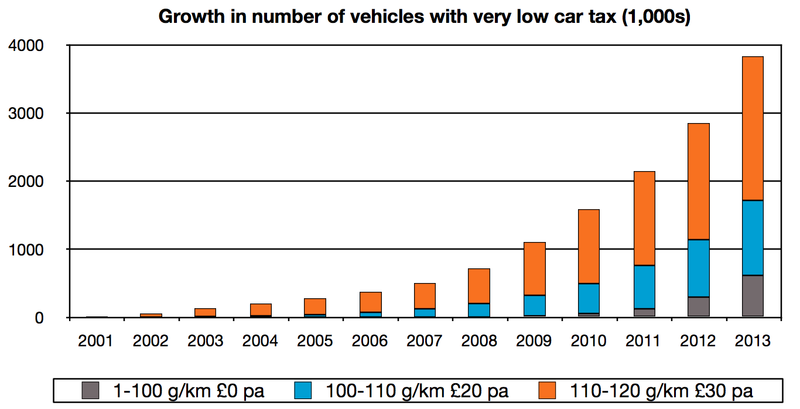 This next chart shows the change in the number of cars on GB roads having accounted for these scrapped vehicles. This also shows the reduction in the rate of growth since 2006 but the number of vehicles has increased in each year including the 418,000 added last year. Ouch! It is also worth looking at the age of the fleet given that the above graph indicates that people are not scrapping cars at the same rate as they are buying new ones. This next chart below is my estimate of how old the oldest cars would be if car were all kept for a uniform time before being scrapped. Although this not hugely accurate it is probably good enough for our purposes. What is shows is that we now appear to be keeping our vehicles for four years longer than we did until 2005. This does fits with my experience. We have a pretty old car and it still looks very shiny and hasn’t let us down. No sign of the rust that used to finish off earlier models. Even with all these cars, we are actually driving less miles each year, with average vehicle utilisation falling by 20% since 1994 from a bit over 10,000 miles per year per car in 1994 to 8,000. Another trend over the past 10 years has been the growing number of vehicles that pay next to nothing in car tax from virtually none in 2001 to 4 million last year. This low tax band has encouraged people to buy cars with low emissions for sure, but has also created a significant fleet of cars which cost less to tax for a year than to fill up with fuel! Finally, here is evidence that young adults are just not getting into the driving habit in the way that they did only recently. The number of 17 year olds who learn to drive has dropped 24%, (or 46,000 people) over the past six year. 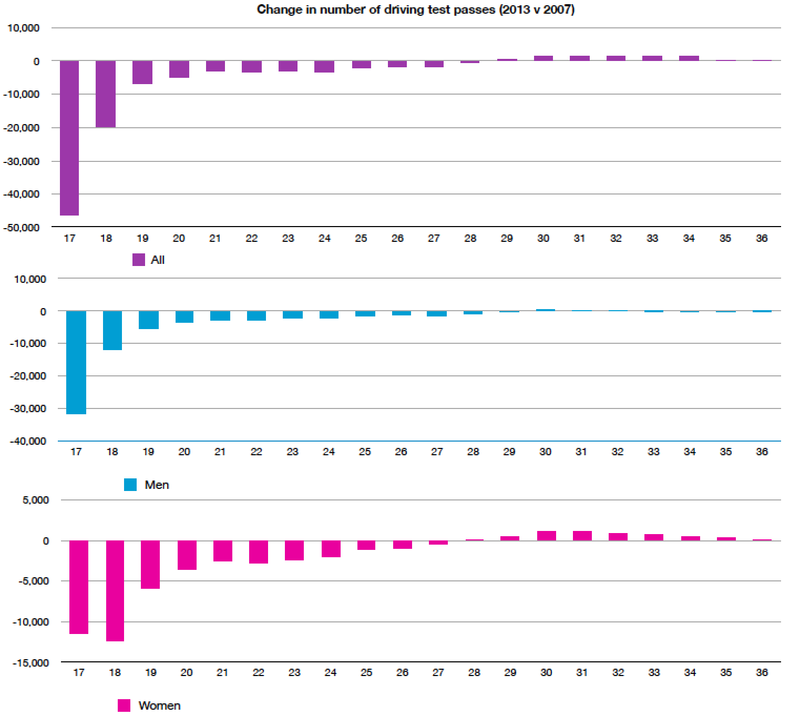 The only group where there is a noticeable increase has been women between 30 and 35, but that is no where near enough to compensate for the earlier reductions. Academics are now watching carefully to see if this is simply that 17-20 yer olds are delaying for a few years and will learn to drive a few years later, or if a significant number will lead their lives without ever gaining a driving license. Zipcar did this interesting research into young adults attitudes to motoring. Parliament published a briefing paper in 2013 looking at the possibility of Peak Car use in Britain and Professor Phil Goodwin has produced this very approachable introduction on these changes. In the mean time I will leave you with a spokesman from the Society of Motor Manufacturers saying how delighted the industry is with all the new cars that they are selling at the moment, many of which will end up on our pavements! ← Proposed CCTV ban to get rocky ride in Lords?